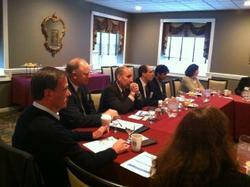 About - Chief Executives Network for Manufacturing of the Capital Region, Inc. The CEN is a not-for-profit member organization comprised of approximately 50 small and medium-sized manufacturing businesses in the Capital Region. Since its inception in 1987, the CEN has focused on providing a high quality forum for its members to discuss common issues, share knowledge, and develop best practices by drawing on the collective knowledge of its membership. CEN’s mission is to provide the opportunities, information, resources, and knowledge that will assist its members in enhancing revenue and growth. Many CEN members believe that the biggest benefit to membership in the CEN is the network of knowledge, experience, and support that it provides, and the willingness of members to share that knowledge and experience. During CEN Member Meetings, members are given the opportunity to present issues that they are facing in their business, and receive input from other members. During day to day operations, knowledge and advice are just a phone call away. The CEN also provides a variety of programs and professional development opportunities for its member executives. Some of the recent topics include: IT for Businesses, Administrative Productivity, Affordable Care Act Update, Fraud Prevention, Cyber Crime, and Safety/OSHA. Membership in CEN is granted to the company; any key members of the company are welcome to participate in CEN programs. As an affiliate of the Center for Economic Growth (CEG), a private, business development organization serving New York’s Capital Region and Tech Valley, CEG programs are also available to CEN members. The purpose of the Chief Executives Network for Manufacturing (CEN) is to establish an educational and informational forum in a peer environment, for the benefit of chief executives of small manufacturing businesses located in the Capital Region of the State of New York, and to offer programs and other similar activities to develop and promote the leadership and management skills of its members. Small firms operating in a manufacturing capacity in the Capital Region are eligible for membership in the CEN. The eleven counties of the Capital Region represented in the CEN are Albany, Columbia, Fulton, Greene, Montgomery, Rensselaer, Saratoga, Schenectady, Schoharie, Warren and Washington Counties.